From the apparatus just showing under the loco’s buffer and the fact that the gent leaning on the hut looks like a postman i would reckon the hut is purely there for the post workers waiting for bags to be dropped. There is a signal box in the far distance right of the train, but I have no idea where other than on a 4 track section of the West Coast main line. Because of its composition, the train would appear to be the 2.00pm “Corridor” Euston - Glasgow. As John says it is on a portion of four way track and hauled by a Precursor which would make it presumably, south of Crewe. The engine change there would present either an “Experiment” or “Prince“. My guess is that it is somewhere in the northern outskirts of London where a very large number of photos were taken at this period. It only remains therefore to locate the Post Office pick up/set down points in the area. There was one at Harrow but somehow it does not fit the print. The first and second carriages are on 6-wheel bogies; others are not seen quite clearly enough to confirm that all are. The third appears to have a clerestory roof and though once again the remaining carriages are not absolutely clear, the fifth has the same pattern of windows as the third and so is probably another clerestory diner. So I am inclined to agree that the formation is right for the “Corridor”. Presumably this is the down train because the daylight is too bright for the up train south of Crewe – it left Crewe at about 7.30 and arrived Euston at 10.45 (no daylight saving before 1917) – unless the picture was taken very near Crewe. If the above is right, surely postmen would not have been loading the lineside apparatus with mail before 5.15pm (when the down “Corridor” arrived at Crewe). The track arrangement seems to be up and down pairs (down fast, up fast, down slow, up slow), otherwise one would expect the “Corridor” to be on the inner line. That was the arrangement between Stafford and Crewe, I think, but not further south. Where on that bit of the line was there a lineside postal pick-up? 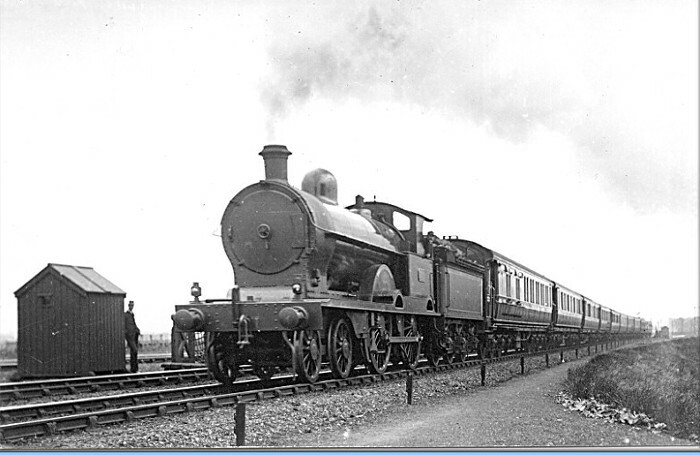 David has forgotten that a few months ago he and I discussed this picture and agreed that the train is the 2pm Corridor in the early years of Precursor haulage in 1903-5 and that it is approaching Watford on the down fast line. The problem with identifying the location is that we all now think of Watford with the electric lines in place. This makes it hard to imagine what it might have been like before they were built, some ten years after this photo was taken. Imagination, of course, can play tricks, but in this case, the curve and embankment are distinctive and can surely only be at Watford. Currently I happen to have in my possession the c1900 track plan for this stretch of line. Click on the image for larger version. What was the normal formation of this train? Nice plan, but it shows the line in a cutting, at milepost 18, just south of Watford tunnel. Portions divided by // Glasgow // Edinburgh // Aberdeen // Whitehaven // Oxford Road via Knutsford. Carrages in bold type were 65ft. There seems to be an extra vehicle or two and the CK/RC of the Glasgow portion are the wrong way round (unless that was standard before 1909). It is clearly before the Georges and superheater Precursors but does it have to be as early as 1905. When were the electric lines to Watford built? Jack is right, of course, the date does not have to be 1903-5. The first Precursor was actually built in March 1904, so 1903 is impossible. When the Experiments were introduced (first one into stock in May 1905), they took over the Corridor (the exact date I do not know) and 1987 Glendower (into stock October 1906) became the regular engine on it. So a more accurate date would be 1904-6. Of course, it is possible that the Precursor in the photograph is substituting for a failed Experiment after 1906. Do the carriages give a more precise date? As regards the dates of the electrification, M.C.Reed in “The London & North Western Railway” says on page 190 that the reconstruction of Watford Junction station started in 1908 and the construction of the Harrow-Watford section by the end of 1910. Details of the opening of electrified sections are given on page 194. I’d opt for the south of Watford Junction, too. Just to the south of where the junction for the electrics to High Street leave the main line and the start of the embankment towards Bushey. A rather wide six foot and, if I’m not mistaken, a row of wagons in the sidings behind the hut; all seems to fit. There’s also road access nearby. Goodness knows why apparatus was located at the south of Watford Tunnel, as shown on the extract from the old LNW Land Plan (where was that obtained from?). I can only think that it eventually got pretty scary for the Postmen to cross the lines and the apparatus was either taken away completely or re-located to a safer and more convenient place. If carriages other than the diner are on 6-wheel bogies (and the first carriage is) the implication is that this is “Corridor” stock – in which case the date must be 1908 at the earliest. That would suggest a Precursor substituting for an Experiment . Even if the train were an American Special (and it seems rather long for that) the earliest date would still be 1908. But in that case the Precursor would not necessarily be a substitute. This appears to be the Down Corridor hauled by a Precursor and comprised of the beautiful six wheeled stock of that time. If this is correct then the time would be about 2 p.m. and the only Up mail whose imminence is announced by the lounging postman could be the Up Irish Mail although in my time it passed Llandudno Junction at about 1.15 p.m. so the timing must have been earlier in those days. Alternatively it may be a Boat Express to Liverpool Lime Street but my guess about the Irish Mail still holds good because as far as I am aware the Irish Mail was the only postal running in daylight.